A few days ago we stopped by a local waterfall. It was surrounded by snow and frozen over in parts – just really beautiful! 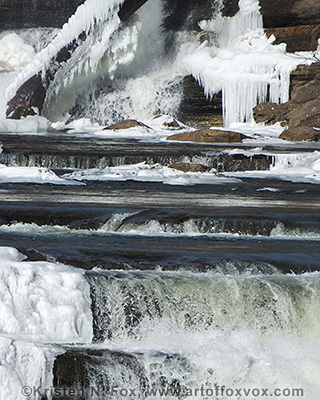 In the first image, I love the icicles of course, but also the deep midnight blue of the water and the brown rocks. 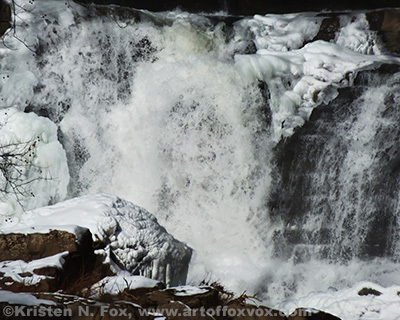 In the second image, I especially like the big gush of water with the frozen boulder contrasting in front of it. The day I took these photos was one of the first recent days we’ve had where the temperatures were above freezing – this is how we celebrated – LOL!